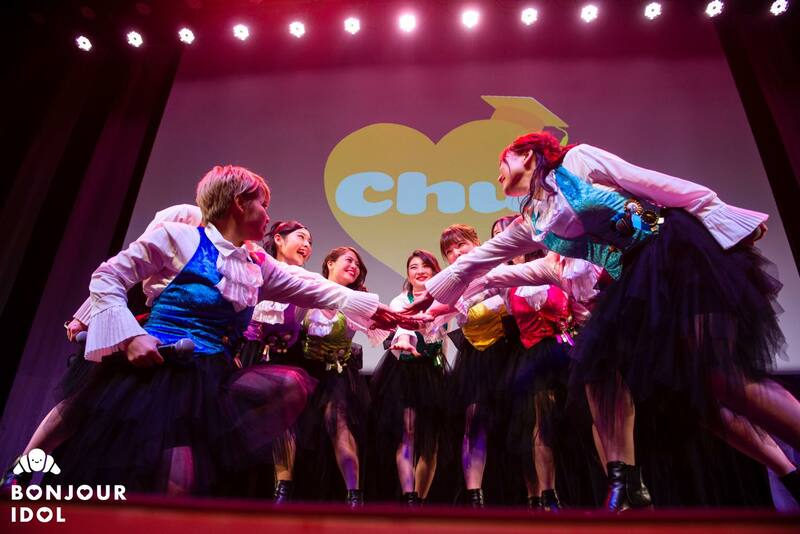 Finish line for Japan’s happiest idol group: the members of Chubbiness parted ways hand in hand on March 9th at Kanda Myojin Hall. 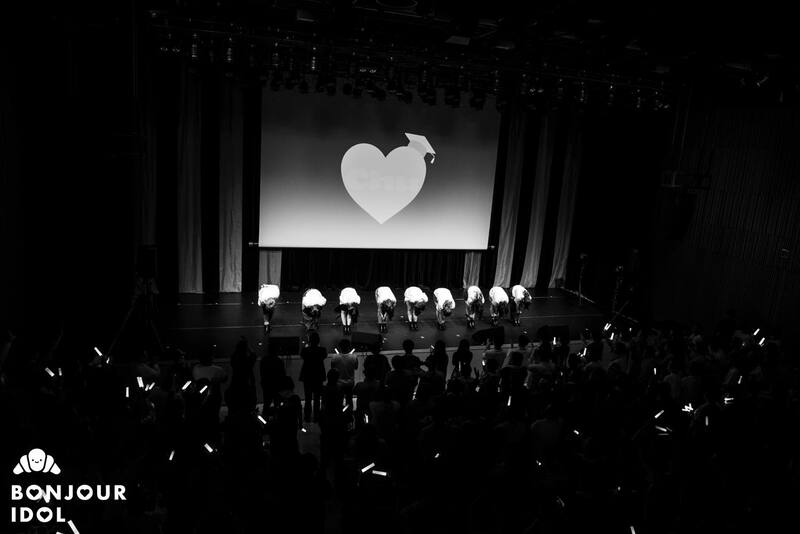 It is in a very Chubbiness-like double performance that the group separated after five years and four months of laughter and tears with their fans. Two shows for two very different tones were seen that day! The first performance started off in a rather festive atmosphere! Dancer-comedian amimaruchan opened the show with a medley of her best dances, posted on the popular app TikTok, for the last time. The Chubbiness members then arrived on stage from the back of the venue, dressed in graduation robes and hats. “Motto HOTTO! ga motto!”, “Purun♫tto Heart♡” and the now-legendary “Odoru Ah!Hooo” are played one after the other, getting the fans already quite excited, at the dawn of this final point to their favorite group’s history. The three Chubbiness dancers, Kawai Akina, Horikawa Ami and Yaegashi Kotomi, then offer one of their usual dance interludes, right before performing their last songs in smaller units. First the cool “Crazy about me” with its rock vibes, then the sentimental ballad “CO;” open this part of the concert, before taking a break for a small lottery to give some gifts away to a few lucky fans. The catchiest rap duet “STORY YOU MAKE” then end on a cute kiss between Prince Marino and Princess Rika. The show ends on the same joyful mood as it began with, and it is after a quick group rope jumping challenge that “DRY YOUR TOWEL ~kawakase taoru~” closes the main part of the show. The encore calls follow right after, and Chubbiness happily comes back on stage for three catchy numbers: “Koi no Emotion”, “Paricchu♡Puricchu”, and, after a few emotional words were spoken by the members to their fans, “Odoru Ah!Hooo” for the second time. Over the final goods sales and pictures session in-between performances, fans had carefully prepared diploma certificates and flowers for each one of the members. It is not without a fair share of emotional tears that they improvised a small graduation ceremony right before Chubbiness’ final performance. It is in a completely different atmosphere that the second show starts, opening on the sweet voice of Nakazaki Erina and her solo lines for “Kimi ni”. A thick layer of emotions invades the entire venue, while fans and idols fight back the tears. Chubbiness then perform not less than nine songs one after another without interruption, aside from the contemporary dance interlude by Yaegashi Kotomi, to the melancholic sounds of “Nostalgia”, one of the original songs created by Nakazaki Erina for one of the group’s entertainment shows. After performing their two first digital releases, “Manmadeiya!” and “Motto HOTTO ga motto!”, Chubbiness line up on stage to let their fans know of what they had decided for their individual future projects, not without tears and sobs – especially from Kawai Akina and Ikeyama Chiaki, despite being two of the group’s biggest airheads and usually of the most emotionally laid-back members. We then learn that Horikawa Ami, Kawai Akina, Morimoto Eri and Takao Sonoko will retire from the entertainment business to follow a completely different path far away from the spotlights. Kawai Akina adds that she is wishing for a career in the entertainment business, but from behind-the-scenes and not as a public figure. Takao Sonoko will pursue her dream in becoming a script writer, stating that she wishes to keep telling new stories, whether for plays, musicals or movies. Nakazaki Erina, Yaegashi Kotomi, Ikeyama Chiaki, Saihara Marino and Shima Rika will be staying in the business as avex talents. Erina wishes for a career in acting, just as Chiaki, who adds modelling to her list of goals, and Rika, who more specifically aims at jobs as a voice actress. Yaegashi Kotomi will keep going in her current activities as a musical comedian and television actress, and Saihara Marino will keep supporting and promoting sub-cultures as a talent. This final performance ends on a rare interpretation of “Yume, Ekakubasho”, leader Shima Rika even dropping Asakawa Misaki‘s name, one of the group’s former member who had graduated a couple of years earlier, and who was spotted by fans in the audience this day. While the first encore call resonates, the members happily come back on stage, and it is time for fans and idols to wipe their tears off: a message from producer Kosaka Daimaou teases for a special guest appearance – a rather famous one! The legendary Pikotaro blasts on stage, surprising Chubbiness so much that Morimoto Eri and Kawai Akina immediately start crying! Pikotaro gifts us an exclusive version of the now-worldwide known “PPAP”, ending the song on a meaningful “Chubbiness Forever” that triggers a round of applause amidst the laughter from the audience. This quality guest joins Chubbiness for a super-hyped up version of “DRY YOUR TOWEL ~kawakase taoru~”, before one final “Odoru Ah!Hooo” concluding this encore. But the fans really wanted to have the last word! A double encore starts, and the members end their idol careers as Chubbiness with a blast, on a crazy and delirious version of “Manmadeiya!”. The girls even pushed Ikeyama Chiaki and Takao Sonoko, the two members of the group with the most “personal” sense of rhythm, to replace Kawai Akina, Horikawa Ami and Yaegashi Kotomi for the dance break… Their own version of the choreography was welcomed with a roar of laughter from both the audience and their fellow members. Chubbiness puts the final word to their idol activities in a rather surprising way. While fans were convinced liters of tears would be shed that day, it was actually quite the contrary! An accurate conclusion for Japan’s happiest idol unit, that definitely did not fail their title for the past five years, and were able to sow smiles and happiness all over the faces of the people who crossed their path. We wish the Chubbiness members all the happiness and success for their future endeavours!